Whether you’ve purchased a new bed frame from IKEA or recently moved into a new place and need a whole new bedroom set, our team of professional, experienced and punctual assemblers can quickly and accurately build a queen, king or full sized IKEA bed frame. You wouldn’t even need to lift a finger! 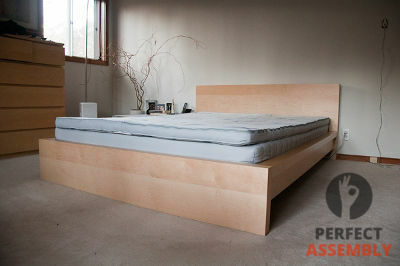 With beds being the best selling item at IKEA, we became especially efficient at building them. Rest assured (pun intended) we can assemble any headboard, guest bed, bunk or bed storage units the way IKEA intended them to be. With our team of expert IKEA bed assembly professionals, we guarantee that your bedroom or guestroom will be set up according to your exact needs. Our goal is to make flat-pack furniture convenient again. Saving you time and energy is at the core of what we do. Our team of experienced assemblers know the ins and outs of IKEA beds regardless of the design and model, and have assembled hundreds of IKEA beds throughout the New York City area. Whether you need a minimalist MALM bed frame or a fancy STUVA loft bed with 4 drawers and 2 doors, we’ll make sure your IKEA bed is assembled with care and perfection. 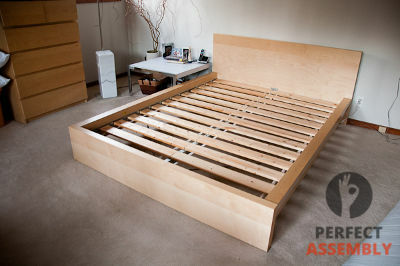 At Perfect Assembly, we don’t just assemble IKEA beds. We build them perfectly. We know that quality built IKEA furniture simply lasts longer and works better. You’ll never have to worry about loose bolts or rattling wooden slats, thanks to our industry knowledge and expertise. 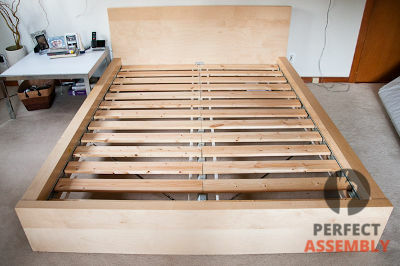 For less than IKEA's delivery fee, PA delivered and put together my bed. They were prompt with a quote, could deliver the day I wanted, and showed up on time! Tim, my Assembler was very nice, professional, and did a great job. Would absolutely use them again! The Perfect Assembly team builds hundreds and hundreds of pieces every year of every line of IKEA beds such as MALM, BRIMNES, HEMNES or MANDAL. We’ve spent thousands of hours building every possible kind of bed for new yorkers, and we’ve worked hard to prove ourselves as a leading team of professional IKEA assemblers. From helping countless of families and individuals assemble their bedroom furniture in no time, we know that not having to worry about assembling your furniture takes a huge weight off your shoulders. Could not have had a better experience. They came in with 3 bed frames and within 90 minutes we had everything set up and cleaned. I will 100% use them again on my next move. With Perfect Assembly Inc, you will always enjoy convenience and reliability. Hundreds of our happy customers know that the convenience they gain from our assemblies come at a level of unparalleled quality. Perfect Assembly doesn’t just assemble a bed. It’s offering peace of mind that your furniture assembly is done right, in order to make your life easier. So sit back, relax, and let us professionally assemble your LÖNSET slatted bed base for your NORNÄS bed frame. In case you wonder about the assembly cost of your project, please don't hesitate to contact us for a free quote. Most emails answered in just 30 minutes or less!